Ascending Butterfly: Snack Rut? How does Chocolate and Truffles strike you? Snack Rut? How does Chocolate and Truffles strike you? I have had a life long love of travel, and each trip I have had the fortune of taking be it for business or pleasure always has a special memory that is unique to that particular trip. For me it's not about coming back with a ton of dust catchers that get stored away to never see the light of day. I take tons of pictures, visit places on and off the beaten path, and enjoy experiences, sometimes it's the arts, sometimes it's culinary, sometimes it's just being still like at a tropical beach at sunset. I'm a music lover and somehow am always thinking music and soundtracks to moments in my life. They say smells take us back to a time and place, pictures can do that, tastes can do that and so can music. Everytime I hear Tony Bennett's - (I Left My Heart) In San Francisco, my mind races right back to my very first trip to the city by the bay! I was there for a convention but everytime I travel I make it a point to factor in some 'ME' time. Time to just let my feet and my mind wander. And one of my favorite 'me' time moments was a visit to Ghiardelli Square. Where I got my first introduction to a brand who had actually relocated there in 1895. Ghirardelli square is where the flagship Ghirardelli Chocolate Ice Cream and Chocolate Shop is located. And the place where I got my first introduction to the brand and their delectable chocolate. I got to try some there, and bought some that I tore into sitting outside where a local band was playing. I picked up several CD's from that band, and each time I hear them I am brought back to that moment. It is a cherished memory for me. And while much like Tony Bennett's song I fear that I may have really left my heart in San Francisco, air travel is expensive, and I don't get out there nearly as much as I'd like, but the closest I can come to an escape is putting on my CD's that I bought at the square and enjoying some Ghirardelli Chocolate at home. 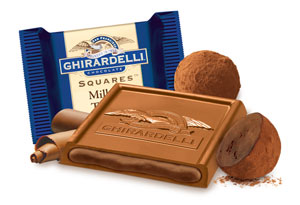 While I love most of the stuff I have tried from Ghirardelli throughout the years, I keep going back for their signature squares. My absolute favorite being their Dark Chocolate Raspberry. They are rich and satisfying, a decadent escape indeed and also always take me back to sitting on the square and enjoying my find! 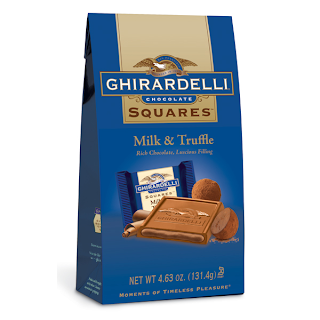 So when given the opportunity to try the Ghirardelli Milk Chocolate with Truffle Filling SQUARESTM, I definitely jumped at the chance. Chocolate AND Truffles? Um, YES Please. Many moons ago, when financial firms still existed I worked in a firm that had a truffle shop in the lobby. A truffle shop that made each truffle by hand, I was obsessed with that shop, and haven't ever really had a truffle that compared. 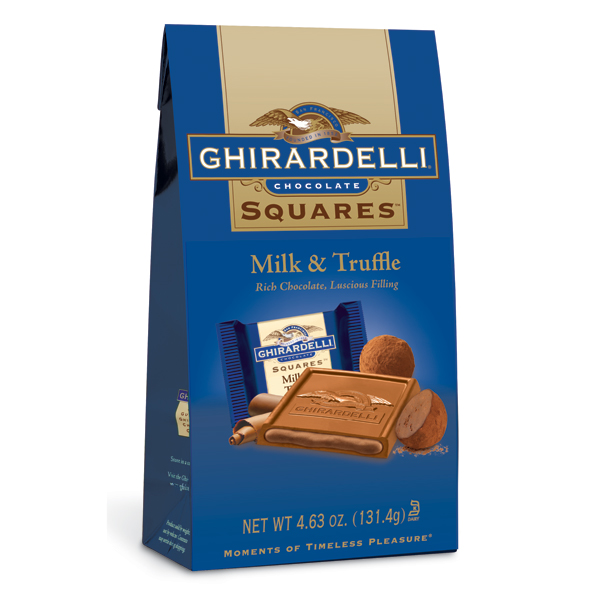 Ghirardelli's Milk & Truffle Squares were definitely a sensory delight from 'square one' (really no pun intended, well maybe a little), they took me back to two very pleasant memories, my visit to San Francisco's Ghirardelli Square, and my favorite New York City Truffle Shop all in one bite! FTC Disclosure: I received the product for this review for free, courtesy of Ghirardelli and SheSpeaks. However, all opinions are 100% my own. I am disclosing this information in accordance with the Federal Trade Commisions 16 CFR, Part 255 Guides Concerning the Use of Endorsements and Testimonials in Advertising. Our full Giveaway Rules and Disclosure Policy can be found HERE. Weekly Moment of #Gratitude + #Giveaway Updates! Monday Motivation: Are you a radiator? Happy St. Pattys Day Butterflies! To Pin or Not To Pin? That is the question! Wordless Wednesday - Welcome Darlings!